BACK IN STOCK!!! Hailing from the coastal town Brest in the far north-western corner of France LITOVSK deliver a fulminant and outstanding debut album. Eleven songs of dark and gloomy Postpunk/Wave. You could say, you've heard it before and yes, you proabably have: Some of the songs were taken from their 2014 Demo Tape. Rumbling and driving basslines, straight drumming topped by partly wavey guitar riffs: simple, clean and honest while retaining a good portion of frenetic power and energy. Think of THE ESTRANGED, NEW FLESH or RED DONS. 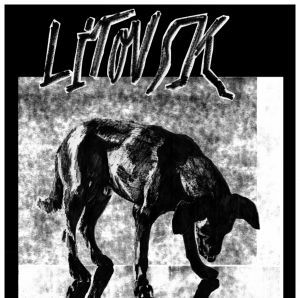 A Band to reckon with: LITOVSK is defintely one of the best Postpunk coming from Europe these days. On this records they manage to give an extra vibe to the last wave and created eleven hymns to dance and sing along with.